I have a handwritten note from my mom sitting on my dresser. This note is over 15 years old and probably one of the most treasured items I have in my home. It just simply tells me how she and dad love me and is so thankful that God gave me to them as a daughter. 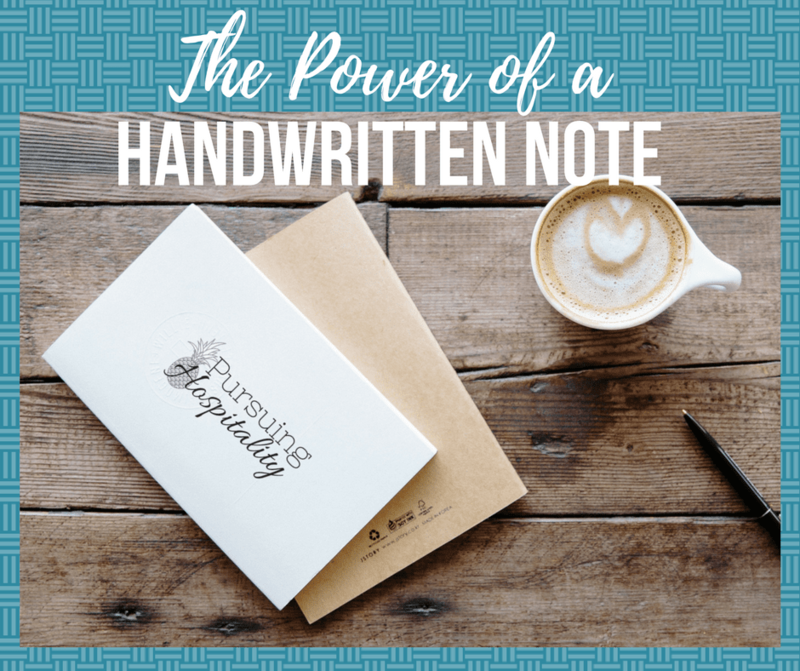 My mom probably had no clue the power of a handwritten note of just 3 – 5 sentences would still be an encouragement to me every morning and evening when I am getting ready for the day or bed for the past 15 years. We are living in a society that is slowly losing its human touch through written form. Letters are attached to emotions and feelings. Have you ever pulled out letters that someone has written you and you can remember like it was yesterday? I bet you could even remember where you were when you were reading the letter. I remember when my husband, boyfriend at the time, wrote me a letter telling me about his feelings for me. Standing in front of Ms. Bartow’s room. Butterflies were all in my stomach because I had to walk past the class that Gregg was in. I get that feeling each time I read the letter. It brings back that emotion. Take some time and bring back the art of letter writing. 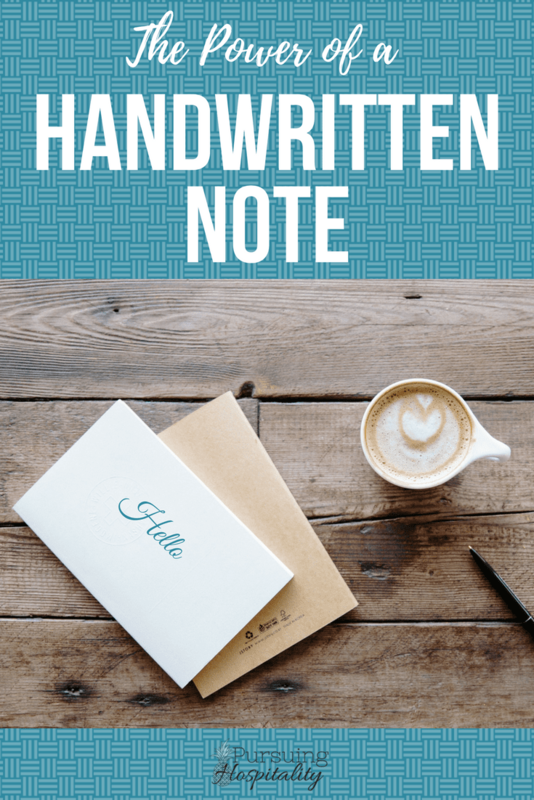 3 ways you can write a letter to someone this week. Write a love letter Write a letter to someone that you love dearly. Your husband, your child, your best friend. Tell them why you love them. Tell them things that you love about them. Share with them how they have made your life better by loving them. This will be a letter that is cherished. Write a letter of encouragement Write a letter to someone that you know is going through a tough time. Maybe a student that is struggling with school and family, maybe a wife that is worn out from caring for the children and having to care for the home without help, maybe it is to a person that is fighting cancer or another illness. Spend the time sharing with them that you are thinking about them and praying for them. Encourage them to press forward and that you are there for them. Letters to mark specific events and dates Don’t forget the important dates in your families lives. Maybe a birthday, a graduation, an anniversary or just completing a HUGE test. This is probably the one that I struggle to keep up with the most and should be the easiest. Keep cards and stationery on hand that you can celebrate with your friends and family on their special days. It is always great to get a handwritten card in the mail that shouts Happy Birthday or Way to Go. It brings value to the person and value to their accomplishments. Writing letters and sending cards don’t cost much. The cost of the paper and the stamp is what you will need to budget. But the value that you bring with the gift of time and words is far more valuable than you will ever imagine.